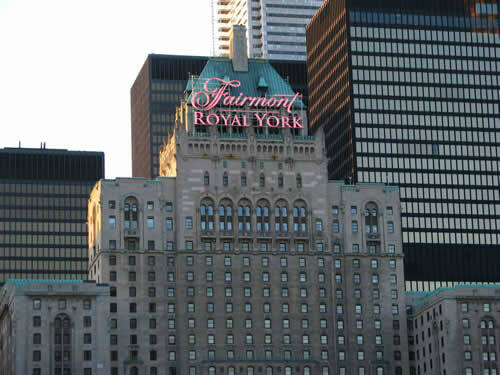 The Fairmont Royal York Hotel is a large and historic hotel in downtown Toronto, Ontario, Canada, at 100 Front Street West. Opened on June 11, 1929, the Royal York was designed by Ross and Macdonald (with Sproatt and Rolph) and built by the Canadian Pacific Railway across the street from Union Station. With 28 floors, the Château-style building was the tallest building in Toronto at that time, and the tallest building in the British Empire until the construction of Canadian Bank of Commerce tower on King Street the following year. The red-brick Gooderham Building (commonly referred to as the “Flatiron Building”) is a historic landmark of Toronto, Ontario, Canada located at 49 Wellington Street East. On the eastern edge of the city’s Financial District (east of Yonge Street), it is in the St. Lawrence neighbourhood wedged between Front Street and Wellington Street, where they join up to form a triangular intersection. Completed in 1892, it was an early example of a prominent “Flatiron” building. Other “Flatiron” examples are the English-American Building in Atlanta, completed in 1897, and the Fuller Building in New York City, completed in 1902. 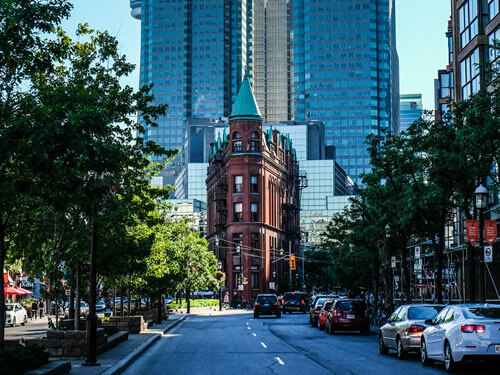 The Gooderham Building is the focal point of one of Toronto’s most iconic vistas: looking west down Front Street towards the building’s prominent rounded corner, framed on the sides by the heritage commercial blocks along Front Street, and with the skyscrapers of the Financial District towering in the background. The CN Tower is also visible from certain angles behind Brookfield Place. This vista frequently appears in imagery of the city. The Hockey Hall of Fame was founded in 1943 to establish a memorial to those who have developed Canada’s great winter sport — ice hockey. 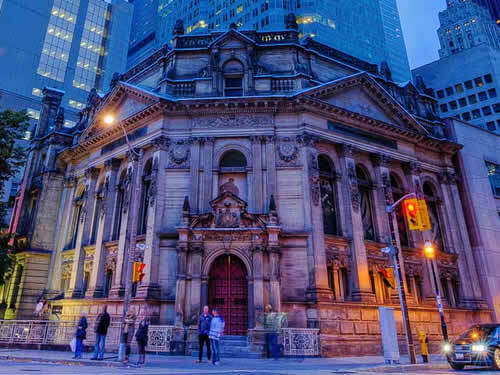 Incorporated in 1983, Hockey Hall of Fame and Museum (“HHFM”) exists in order to honour and preserve the history of the game of ice hockey, and in particular, those who have made outstanding contributions and achievements in the development of the game. HHFM will collect, preserve, research, exhibit and promote all those objects, images and histories which are determined to be significant to the story of ice hockey in Canada, and throughout the world. HHFM will carry out its exhibition activities both in its facility at Brookfield Place (formerly BCE Place), Toronto and whenever permissible through outreach programs. HHFM is a non-profit corporation without share capital and a Registered Charity under the Income Tax Act (Canada). Timeless elegance and the glamour of a bygone age characterize the Great Hall. Along with its towering ornamental ceiling embossed with gold accents, the grandeur of the room is felt in its expansive 2700 square feet. Red plush furnishings and fine paintings adorning the walls of the Hall serve to complement the decor and add a luxurious touch to any affair. Seating 200, the room is filled with light from the arched framed windows. At night, the majestic gas-lit glass chandelier hanging from the central point of the room casts a warm, decadent glow upon guests to the hall. An architectural masterpiece admired throughout Toronto’s history, the Great Hall is truly the place to celebrate your special occasion. It’s one of the world’s great markets – each merchant a square on a lively and authentic patchquilt. The mothers, sons, fathers and daughters whose hard work and passion for food and their craft make up the collective story of the Market. 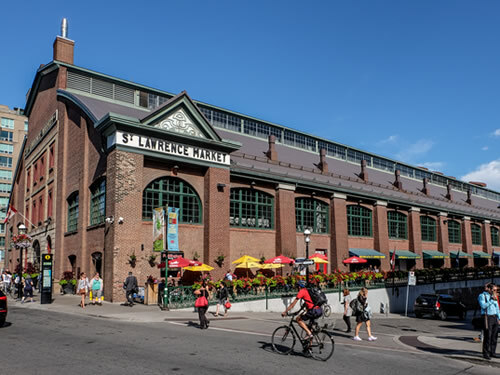 The main and lower levels of the South Market contain over 120 specialty vendors, known for the variety and freshness of their fruit, vegetables, meat, fish, grains, baked goods and dairy products, as well as for the uniqueness of the non-food items for sale. The second floor of the South Market is home to the Market Gallery, an exhibition space for the City of Toronto’s Cultural Services. 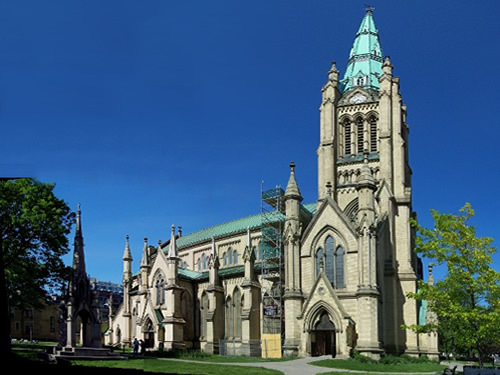 The Cathedral Church of St. James is both a parish church ministering to the historic St Lawrence neighbourhood and a cathedral (the church where the bishop’s chair or throne – the “cathedra” – is located), making it the spiritual centre of the diocese and a focal point for the civic life of Toronto, one of Canada’s most prominent cultural and financial centres. The Cathedral has been designated as an Ontario Heritage Property by the Ministry of Culture and has also been designated as a heritage site by Heritage Toronto. The Toronto Sculpture Garden has been the site of innovative contemporary sculpture installations since 1981. This small, urban park in the downtown core serves as a testing ground for visual artists to experiment with public space and to address issues of architectural scale, materials and context. It has given some artists their first opportunity to work out-of-doors, to experiment with the challenges of siting work within an urban environment and it has provided them with critical experience for future public art projects. Many, including Susan Schelle, Stacey Spiegel, Brian Scott, Mark Gomes, John McKinnon, Carlo Cesta, Judith Schwarz, Stephen Cruise, Reinhard Reitzenstein, Yvonne Singer, Brian Groombridge, Lisa Neighbour and Warren Quigley, undertook their first public commissions after exhibiting in the Toronto Sculpture Garden. 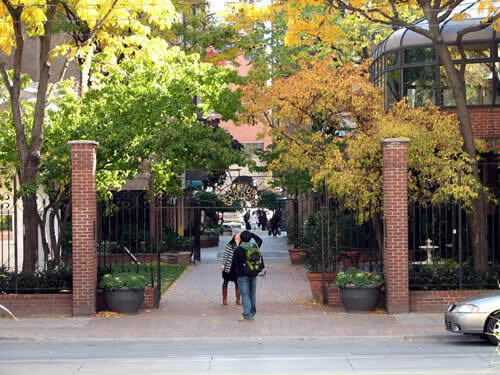 Located at 115 King Street East, near Church Street and opposite St. James’ Cathedral, the Garden is both a civic and a private initiative. It is a unique partnership between the City of Toronto, which owns and operates it as a city park, and the Louis L. Odette family, who created a non-profit foundation to fund the exhibitions. The City of Toronto has been an active participant in this partnership with Mayors David Crombie and John Sewell having played a significant role in the development of this special city park with privately funded art exhibitions. Canada’s oldest surviving purpose-built post office, in the heart of Toronto’s historic St. Lawrence district. Toronto’s First Post Office is a museum and full-service postal outlet. 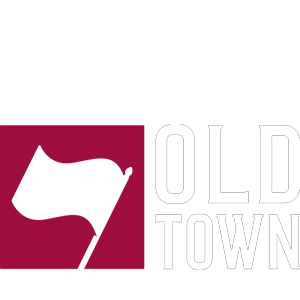 Toronto’s First Post Office is operated by the Town of York Historical Society. 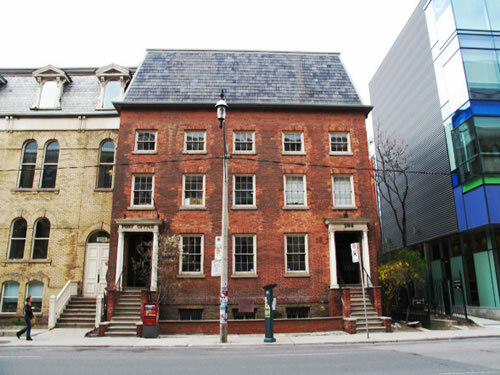 Our museum tells the stories of the Town of York, and the early City of Toronto. 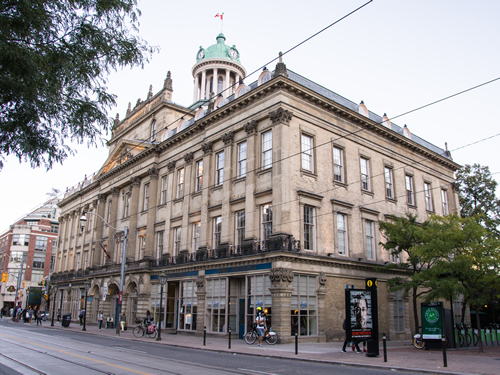 Toronto’s First Post Office is also a full-service post office, open seven days a week. 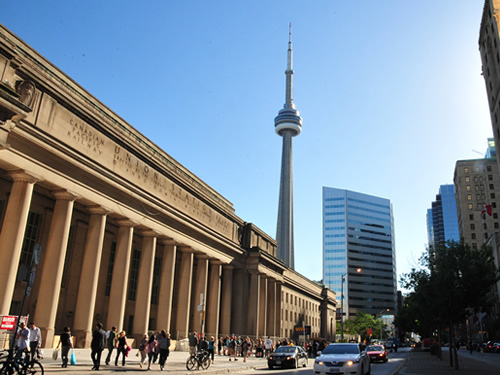 Union Station is the primary railway station and intercity transportation facility in Toronto, Canada. It is located on Front Street West, on the south side of the block bounded by Bay Street and York Street in downtown Toronto. The station building is owned by the City of Toronto, while the train shed and trackage is owned by the commuter rail operator GO Transit. Union Station has been designated a National Historic Site of Canada since 1975, and a Heritage Railway Station since 1989.